I wasn't sure what to expect with this book. I knew it had a dystopian feel to it, but I honestly haven't heard a huge amount of buzz about it (except for when the cover first came out). I have been reading a TON of dystopians lately (I just finished Insurgent), so I was a little concerned that there was no room left in my heart for a new dystopian book. This book was different. It didn't follow the same "formula" as other dystopian books like Divergent, Delirium, Matched, etc. Breathe focused on three characters- Alina, Quinn, and Bea: all who are in very signifcantly different places in their lives. The government is controlling oxygen after some sort of awful plague that killed most of the world. Now people live in a bubble, unable to breathe outside of it without breathing packs because of the lack of oxygen. You can tell by the cover that there are no trees- all the trees have been destroyed and no trees= no oxygen. It was a very interesting premise for a book and one that had the potential to sound preachy about the environment- but it absolutely didn't. The author didn't make it sound that way at all. I really enjoyed the relationship that Quinn, Bea, and Alina develop throughout the story (as well as the many side characters- there were a lot to keep track of!) The story didn't turn out how I expected it to and it moved much faster than I anticipated. 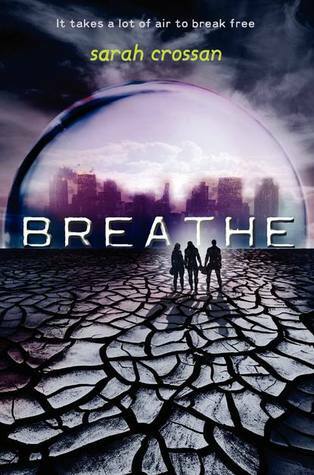 If you are a fan of dystopian, science fiction, or simply a good read that doesn't drag- pick up Breathe. I am looking forward to the sequel to this very memorable debut! I've been looking at this one for some time and man good reviews, including yours, are making me want to make a trip to the book store..